Black Market For Suntans Following Government Solarium Bans | [All Things Tanning] For Tan Fans! 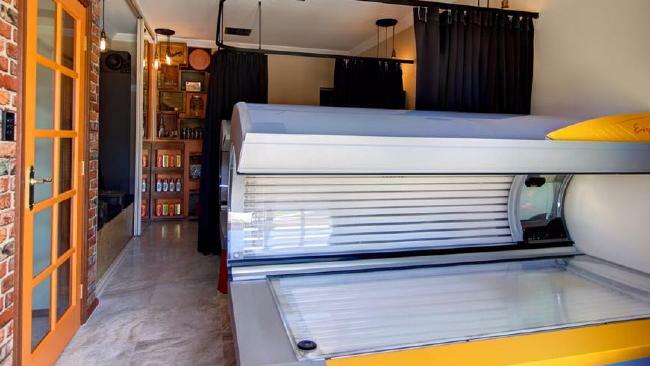 A BLACK market for suntans has emerged with solarium owners operating illegally out of private rooms and backyards since the deadly tanning beds were banned for commercial use in Australia. Solarium beds emit dangerous levels of UV radiation and have been scientifically proven to significantly increase the risk of the most dangerous type of skin cancer, melanoma. Those found guilty of commercialisation under new laws banning commercial use of solariums in every Australian state and territory except the Northern Territory, face fines of up to $44,000. But the purchase and use of UV tanning beds for private use at home is still legal and has seen some rogue operators take their businesses underground. Demand for the service is high with online classifieds sites today littered with hundreds of ads posted by people across the country begging to use privately-owned sunbeds in return for payment. The ads appeared as an accused backyard solarium operator faced fines of up to $10,000 after becoming the first person to face court in South Australia under laws banning commercial use of tanning beds, the Adelaide Advertiser reported. Jake Byron Martin-Herde, 27, of Salisbury Downs, appeared in the Adelaide Magistrates Court on Monday charged with providing cosmetic tanning for a fee while carrying on a business. Martin-Herde was the first person to be charged with the offence in SA since the State Government made it illegal for any person to provide a commercial tanning service. Martin-Herde’s charge relates to three Ergoline brand tanning units at his house that he allegedly advertised to potential customers through Facebook and Instagram using the name “Sharelarium” and “Jake Sharelarium”. The Environment Protection Agency, which is prosecuting the case, will allege that several customers took up the offer and paid Martin-Herde to use the tanning beds between February and March last year, the Adelaide Advertiser reported. Martin-Herde on Monday asked the court for his matter to be adjourned while he consulted with his lawyer. He is yet to enter a plea and was excused from attending court when his matter returns next month. Outside court, Cancer Council chief executive Lincoln Size said no tan was worth dying for. “Any use of a solarium, particularly under the age of 35, significantly increases a person’s risk of developing melanoma,” he said. While not commenting on Martin-Herde’s case specifically, Mr Size said he commended the Government’s commitment to cracking down on backyard solarium use, according to the Adelaide Advertiser. The laws came into effect in New South Wales, Victoria, Tasmania, ACT and Queensland on January 1 last year. Western Australia became the last state to implement a ban on commercial tanning beds, introducing the ban from January 1 this year, and has offered operators compensation for any remaining beds still in use. Cancer Council WA director of education and research Terry Slevin welcomed the laws, saying it had been “scientifically proven” tanning beds caused far more harm than good. Cancer survivors such as Donna Schwartz, who blames her melanoma on solarium use in her 20s, have also supported the bans. The 30-year-old said she just wanted that “sunkissed” look when she decided to buy a 10-session pack at her local solarium in Adelaide just over a decade ago. A few years later, when she was 22, tests revealed she had a malignant melanoma. Doctors said the cancer would have spread to her bloodstream if she had left it another two weeks. The effects of tanning beds have been debated since the highly publicised 2007 melanoma-related death of 26-year-old Melbourne woman, Clare Oliver. Ms Oliver advocated against their use shortly after her diagnosis. The Courier Mail reported backyard operators started snapping up second-hand machines in 2013, when plans were first announced to ban commercial use of the tanning beds for the end of the following year. Tanning Studio business owners who watched their “industry go down” at the time predicted “people will be running it (the equipment) in their backyards”. 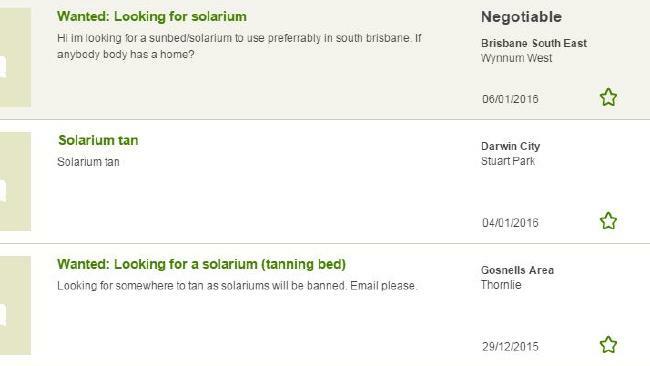 Australian-based sellers were earlier today offering tanning beds on classifieds sites for between $3000 and $4000. But health professionals warn anyone considering seeking out backyard solariums should think carefully about the cancer risks and avoid using the machines.